it's christmas card season! ryan and i absolutely love sending holiday cards each year. we especially love photo cards since they are such a nice way to share little snapshots of our past year with our family and friends. 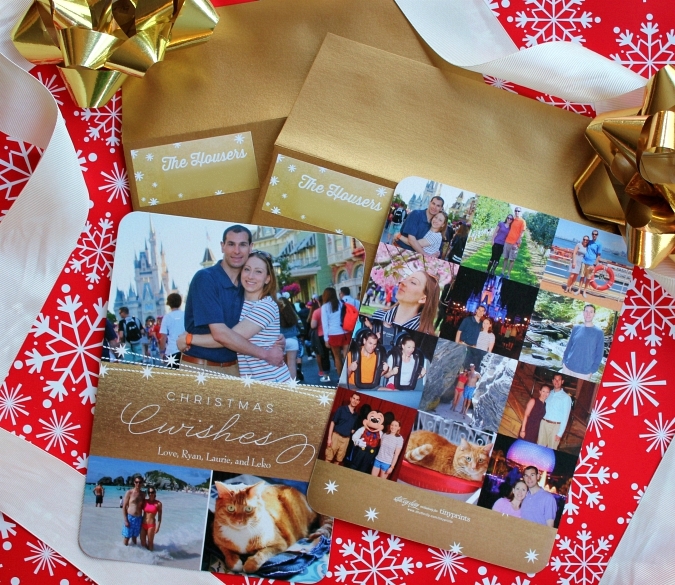 we're thrilled to be teaming up with shutterfly this year for our holiday cards! 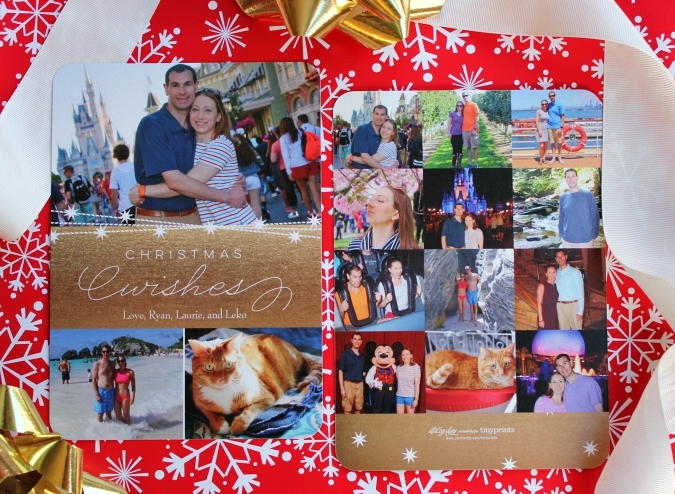 we have been huge shutterfly fans for years, in fact our whole family loves shutterfly. they truly have it all, and the quality of their products can't be beat. (did you know that ryan and i even made our wedding guest book and wedding photo album on shutterfly?) over the years, we've made several photo albums, countless photo calendars, photo ornaments, address labels, and of course many photo greeting cards too. 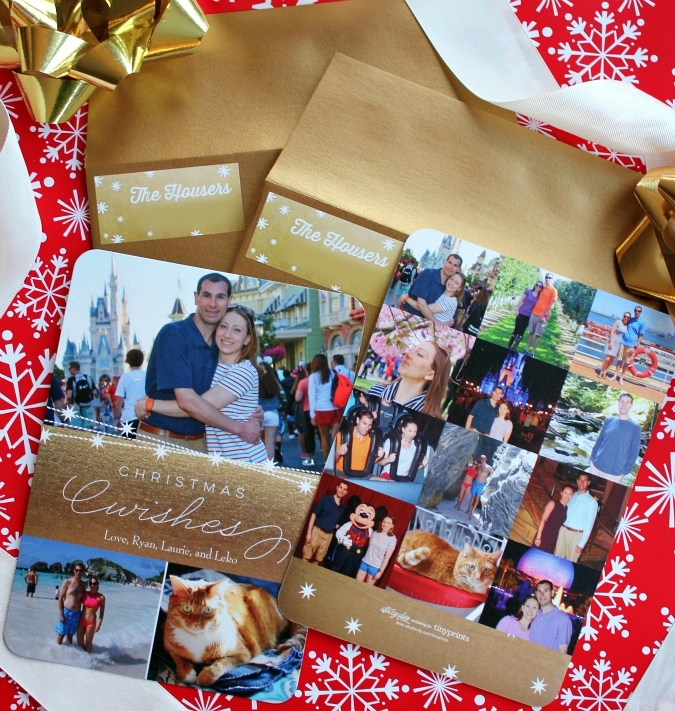 shutterfly truly is a one-stop shop for your holiday card needs because they make whole the process so easy! there are hundreds of beautiful designs from which to choose. once you pick your favorite card design, you can personalize it by choosing your color, trim, paper type, and format. my favorite part of the process is adding in my photos and arranging them on the card. after you select the quantity of cards that you need, you can also customize your envelopes and address labels to match! for this year's card, we chose the 5x7 size of the gleaming gift design in gold with the rounded edge trim on pearl shimmer cardstock. we love how this card allowed us to display several of our favorite photos from the past year. 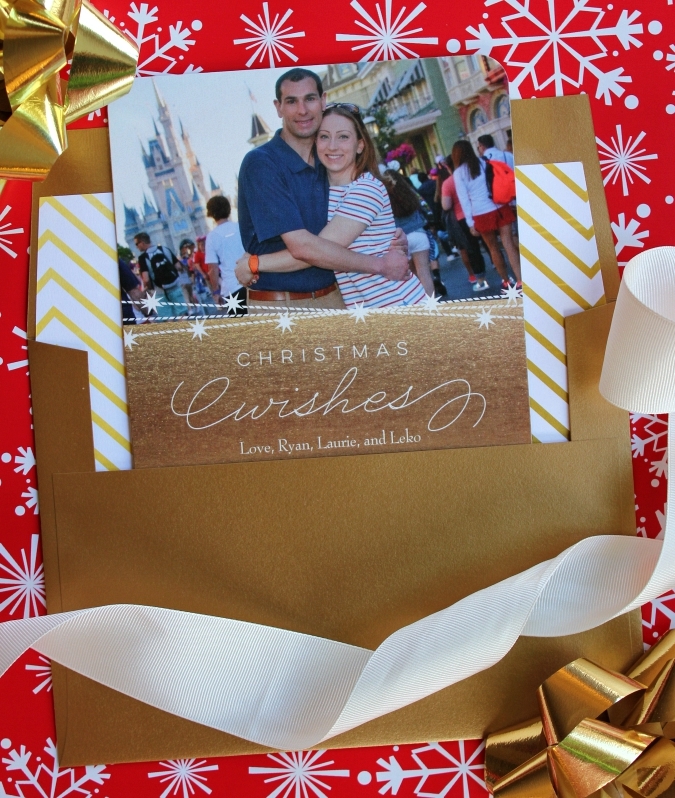 we love how shutterfly makes personalizing christmas cards a super simple few-step process. after just a few clicks, you have made gorgeous looking cards, and before you know it they arrive on your doorstep ready to send out to everyone on your list. 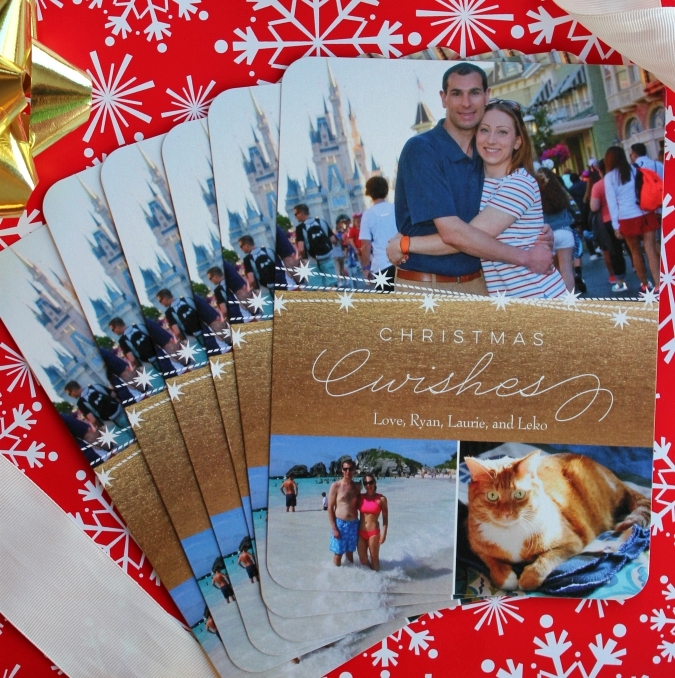 we're grateful for shutterfly's easy system, especially with our super hectic schedules! one of the things that drew us to this design was the "christmas wishes" message on the front. it had a special little meaning for us because we knew we wanted to feature some photos from our trip to disney this past spring. when we were at the magic kingdom, we saw the wishes show at cinderella's castle, and it turns out our timing was perfect because the wishes show was discontinued just a few weeks later. we addressed, stamped, and stuffed our envelopes, and our cards are in transit to their destinations as we speak! 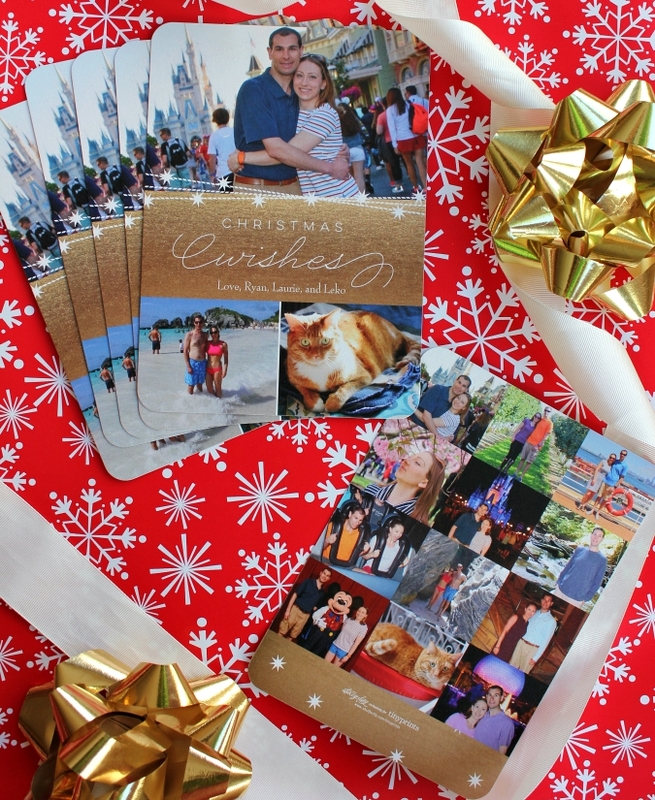 we are so happy with the way our cards turned out this year and can't wait for our family and friends to see them when our cards arrive in their mailboxes! They look gorgeous with all the photos. Can't wait until we get ours in the mail.